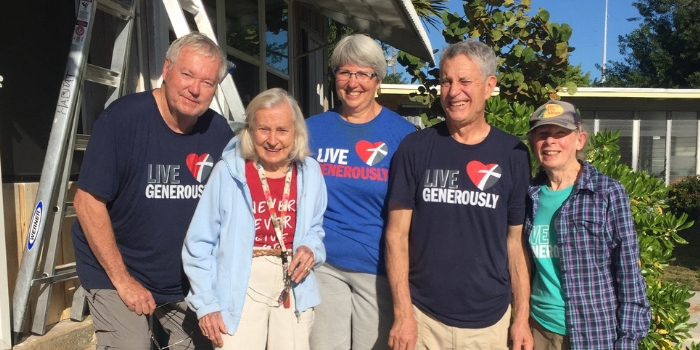 Part of the 2019 Habitat Global Village/Thrivent Builds team in Marathon, FL with Gloria as they finished the porch on her house. L to R: Roger Anderson, Gloria, Marla Zoz, Jim SImeck and Jody Simeck. Hurricane Irma seems a distant event for us living in Nebraska, but for those living in Marathon, Florida, the effects of this devastating storm continue to plague residents. Combine the hurricane’s destruction and the cost of living in the highly sought after beach front views, many local residents earning a living through the tourism or fishing industry find it difficult to have a place to live and making ends meet. This reality met our team of eight as we joined forces with the local affiliate of Habitat for Humanity in Marathon, Florida. In four days we helped put finishing touches on a screened porch for Gloria, an 88-year-old resident of Marathon who has lived in the community the majority of her life. With these finishing touches, Gloria was able to move into her home after living in a FEMA trailer with her daughter, granddaughter and family dog. Two other homes were painted by our team to prepare for two more families. Sheridan plans to send another team back to the Florida Keys for continued partnership with Habitat for Humanity of the Middle Keys. If you are interested in joining this team, contact Amy Wagner or Pastor Rhonda Bostrom. Sheridan plans to partner with Thrivent Builds and Habitat for Humanity Lincoln for its next Faith Build. Stay tuned for ways to get involved.